Additional Information: Son of William and Janet MacMaster; husband of Jessie Davidson MacMaster, of Prestwick, Ayrshire. Arthur McLean, East Lancashire Regiment. 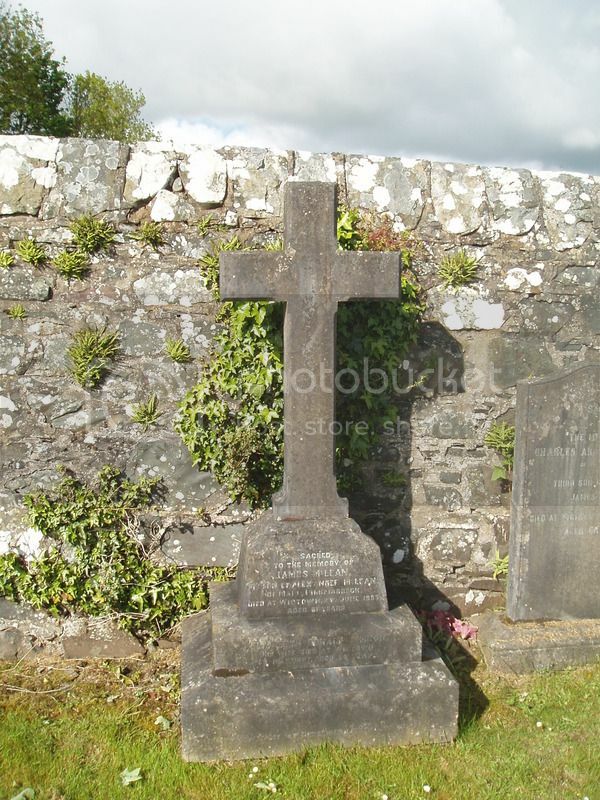 The grave reads: Sacred to the memory of James McLean, fourth son of Alexander McLean of Mark, Kirkmabreck, died at Wigtown on 23 June 1895 aged 81 years. Elizabeth Ronald Simson his wife died at Wigtown 6 May 1897 aged 68 years. 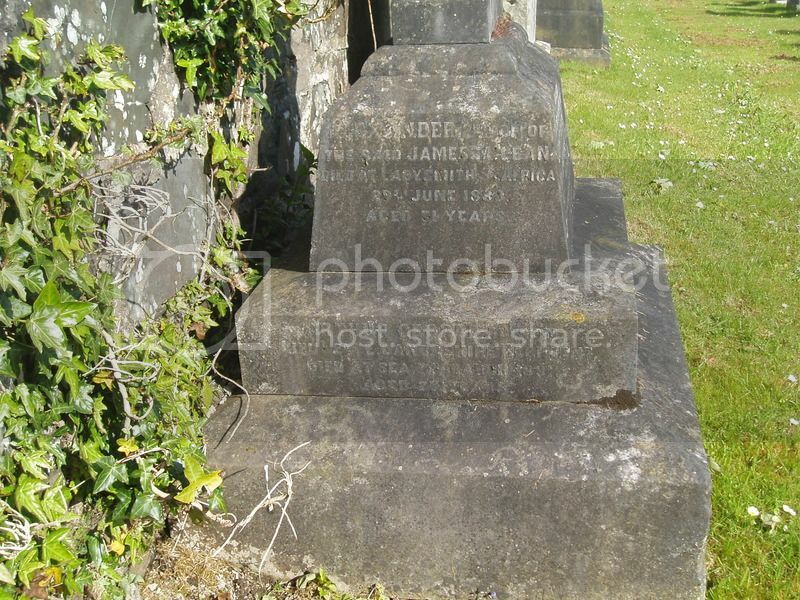 Alexander second son of the said James McLean who died at Ladysmith South Africa 29 June 1889 aged 31 years. Arthur George fifth son Lieutenant 2nd East Lancashire Regiment died at sea 7 March 1891 aged 23 years. 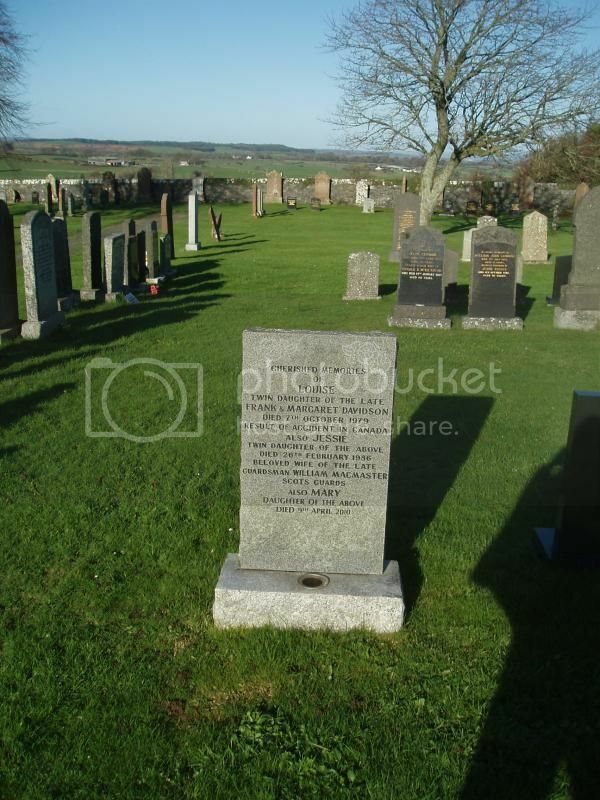 Elizabeth Jane 3rd daughter of the said James McLean died at Edinburgh 25 January 1899 aged 42 years. Wigtownshire Free Press (23/2/1882): The London Gazette of the 10th instant contains the appointment of Arthur G McLean (from the Royal Military College, Sandhurst) to be 2nd Lieutenant of the 2nd Batallion of the East Lancashire Regiment (late 59th infantry). He is the youngest son of Mr McLean, banker, Wigtown. Wigtownshire Free Press (19/3/1891): Suddenly, on board HM Troopship "Crocodile", between Malta and Port Said on the 7th inst, Lieut Arthur George McLean, 2nd East Lancashire Regiment, youngest son of James McLean Esq, aged 23 years. Although Alexander McLean died at Ladysmith close to the time of the siege there is nothing to indicate he was in the military. Wigtownshire Free Press (15/8/1889): At Ladysmith, Natal, South Africa on the 29th June last, Alexander, second son of James McLean Esq, Wigtown, aged 31 years.